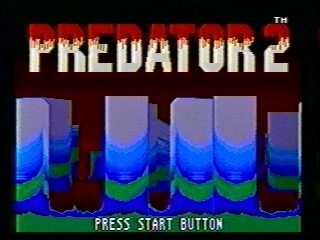 Released for the Sega Genesis in 1992, Predator 2 is a top-down shooter in which you control a pixelated version of Danny Glover. Unfortunately, Predator 2 would not be spared the fate of most movie tie-in games and would depend on its license, rather than its gameplay, to sell. Best time: 0:11:39 by Jonathan 'Barrage' Bean on 2006-07-22. Predator 2 is a top-down shooter in which you control a pixilated version of Danny Glover. The graphics and sound are not great. In fact I had to silence the handgun in order to make the sound bearable. With that aside, the game is quite fun to play. Here's a breakdown of each level. Two slight hang ups on ledges, maybe a second lost. I am unable to exit the level after rescuing the final hostage due to the exit sign not appearing. This seems to happen at random and is solved by moving the exit off the screen -- thus allowing it to be redrawn with the correct properties. I lost a couple of seconds on this, but it seems to be unavoidable. I believe this is the fastest path, but I might be wrong. Everything went well until the semi fight. For some reason I stopped throwing nades before the semi was destroyed. Oh well, another second lost. Perfect -- I didn't get hit and never slowed down. I took more damage than usual at the start, but it makes no difference. That was a nice bit of dodging after the first predator fight, if I might say so myself. It is very helpful to avoid all damage during the early part of this portion because there seems to be unavoidable damage later on. The rest of the portion mainly depends on luck. Example, I got hit by bullets that usually miss and dodged most of the rounds that usual hit. Overall it went pretty well. After the second predator fight I shot at some enemies that I didn't have to, but I was just trying to be careful. Due to the nice placement of the flak jacket between the third and fourth predator, I just charged and blasted them with the machine gun - this seems to work the best. Though it doesn't appear that I needed it, I had to pick up the health at the bottom of the map because it is very difficult to survive the next section when you scharge in directly from the east. However, the enemies aim differently if you come from the south, thus allowing me to avoid most of their rounds. The semi fight and following helicopter fight went rather well. After destroying the final helicopter I walk south to allow the game to redraw the exit door -- thus avoiding the horrible level 2 ending sequence. Everything went excellent actually. Check out me dodging the predator's circular blades after the second flack jacket :) ... and then I start to get hit when I usually don't... then I almost missed a hostage. After rescuing the two hostages from the alcove I somehow get stuck in the left wall. This has never happened to me before and cost me some health. However, I somehow dodge the wall cannons and shoulder cannons while running down the hall to the large predator room -- good stuff. Also, after picking up the last flack jacket I seem to loose my position and walk back and forth -- this is a sign of excitement :) (or lack of concentration). The final boss fight went very well. He's actually the easiest real final boss ever. That's it -- hope you enjoyed the show. David 'RandomEngy' Rickard-- inspiring me to speed run with his epic HL1 run. Scott Ward -- roommate and support. Jim Przybylinski -- speedrun enthusiast.